The Ryman XC-808M is a paper shredder for the home office. In larger offices it can be used as a low-duty personal, desk-side shredder. The XC-808M is a “lift off” paper shredder of the cross-cut type. The shredding cutter sits on top of a see-through, metal mesh waste basket. So you know when the basket is full with paper chaff. A paper shredder is a convenient way to dispose of unwanted confidential papers and financial statements. It preserves privacy and removes personal data from the eyes of would-be identity theft fraudsters. This particular Ryman model cuts paper into narrow strips and then cross-cuts the strips into tiny rectangles 4x18mm in dimension. It has a security or DIN rating of DIN 3. That means the paper particles produced are unreadable. Ryman XC-808M - What’s in the Box? The Ryman XC-808M is a classic domestic cross cut shredder design. The cutter head nests atop a wire mesh waste basket. The metal mesh waste unit lets paper dust out onto the surrounding surfaces. When you lift off the cutting head to empty the bin, paper confetti sprinkles on the floor/desk top. It’s tricky to operate if placed under a table. The controls are on top, as is the paper throat. This home use paper shredder has a safety pressure switch on the base of the cutter head. This “senses” when the cutter is removed from the basket. Some users reported you need to gently jostle the cutter to make sure it is properly nested in the waste basket in order to restart shredding. At Best Buys for we look out for not only the cheapest, but also the best paper shredders for home use. You can’t beat a cross cut shredder for the simple and relatively mess-free secure disposal of private and confidential papers or statements. It’s what your privacy and identity deserve. 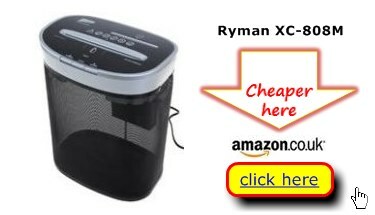 Best Buys Compared is a resource containing user-supplied information and price comparison details on paper shredders for home office use like the Ryman XC-808M.